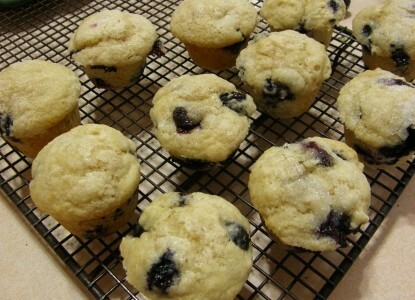 Blueberry Muffins with fresh picked local blueberry's! This recipe is perfect for gluten free baking. 3. In bowl add & mix: sugar, oil, and egg. 4. Add in and mix: the flour or gluten free flour, baking powder, cinnamon, and orange zest. 6. Measure out into preparded pan. I usually have 10 regular size muffins or 20 mini size. 7. Sprinkle sugar on top of unbaked muffins. 8. Bake regular size 20-25 minutes and the mini size 13-17 minutes. 9. Cool 10 minutes before removing from muffin pan.